Hi Shannon! I had no idea I’d been “adopted” until today when I received a ping back in my comments from Eat Recycle Repeat. I apologize for not knowing as I would definitely have thanked you sooner for the kind words and lovely review of my site and recipe. I always enjoy hearing how my recipes turn out for others and now I’m curious to make another batch to see if I can figure out what was different about my ingredients that yours wouldn’t hold together. You are probably right that your almond butter being more dense than creamy. I don’t use any one brand of peanut butter or almond butter and I have no idea what brand I may have used back then. One other thought it since I made the recipe in May, here in Arizona it is pretty warm already and maybe the coconut cream was more liquified. It does look in my photo like the bare ones are glistening as if the coconut cream is very creamy. I think I will alter the recipe to include to make sure the coconut cream is warm and liquified. Your picture is lovely and makes my Coconut Peanut Butter balls look like an elegant treat! Thank you again for adopting me! It was a pleasure adopting you. 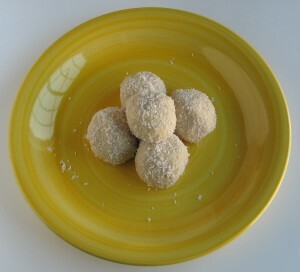 The Coconut (Cashew Butter) Peanut Butter Balls have become a favorite. I took a double batch along on vacation for snacks.